Special features: Frequently confused with the Small skipper as they do look very similar. The easiest way to tell them apart is to sneak up on one, or net one, and look closely at the undersides of the antennae tips. The Small Skipper has an orange tip, while the Essex Skipper has a black tip. 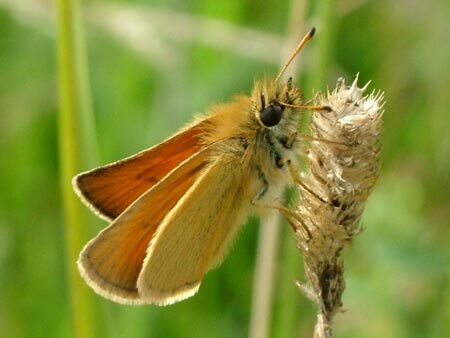 There are some other subtle diferences, like the wing tips of the Essex Skipper are more rounded, and also the scent patches on the forewings of the male run parallel to the leading edge of the wings. In the Small Skipper they run more diagonally across the forewings. Distribution: If you drew a straight line on the map of England from Grimsby down to Bournemouth you could find them almost anywhere to the left of that line. Months seen: June to August. Habitat: Meadows, parks, gardens and roadsides. Food: Nectar. Preferring purple flowers (thistle, buddleia, lavendar etc. The caterpillars feed on various grasses.